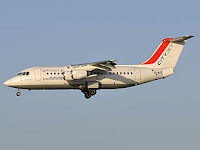 The Irish airline, Aer Lingus, part of IAG announced this week that it was joining forces with another Irish airline, CityJet to expand its operations to London and build on CityJet's long-established presence at London City Airport. The expansion will see Aer Lingus operations between Dublin and London increase to up to 50 daily flights from October 2018. From 28th October 2018, Aer Lingus will operate six daily round trips from Dublin to London City Airport on weekdays, with a reduced service at the weekend. These flights will continue to be operated on an Avro RJ85 of CityJet but it will be under the Aer Lingus brand. These flights will be in addition to the current extensive services between Dublin and London Heathrow and London Gatwick airports the Irish carrier already flies. The new schedule is tailored to provide competitive travel options across the day for both business and leisure travellers. The fares start at €44.99 one way from Dublin and £49.99 one way from London City Airport, plus a steep booking fee of £16 per person if booking directly with Aer Lingus.